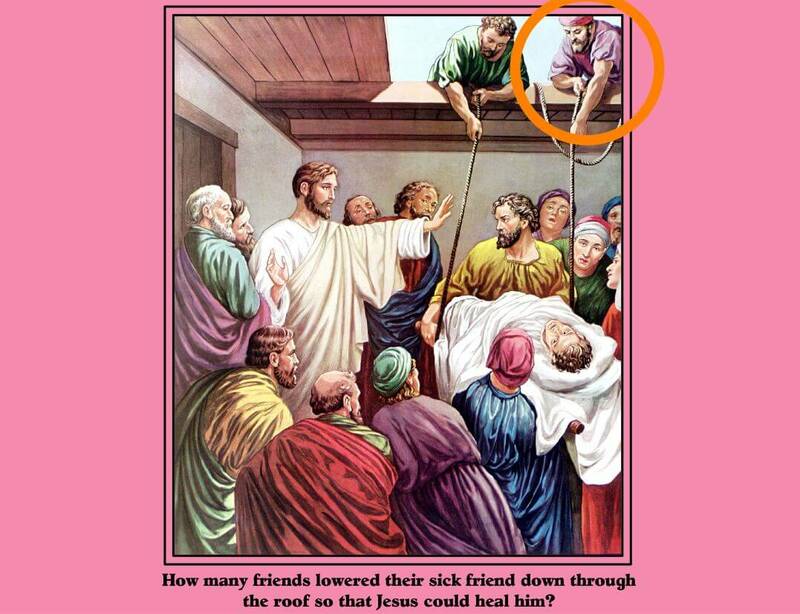 Here is a fun game that teaches the Books of the Bible and their main characters. Do your kids know what book or books Solomon can be found in. Or how about Noah or Elijah or Deborah or Jesus? Play this game and your kids will be well on their way to knowing more about God's Word, the Bible. Several years ago, I came up with a game that teaches the Books of the Bible and their main characters for my large group of elementary kids. I wanted them to become more familiar with the names of each book of the Bible along with their main characters. "Where, Oh Where, is Solomon Found" was born and the kids had a lot of fun with it. Here's how to play "Where, Oh Where, is Solomon Found"
1. Cards that show the names of the books of the Bible. 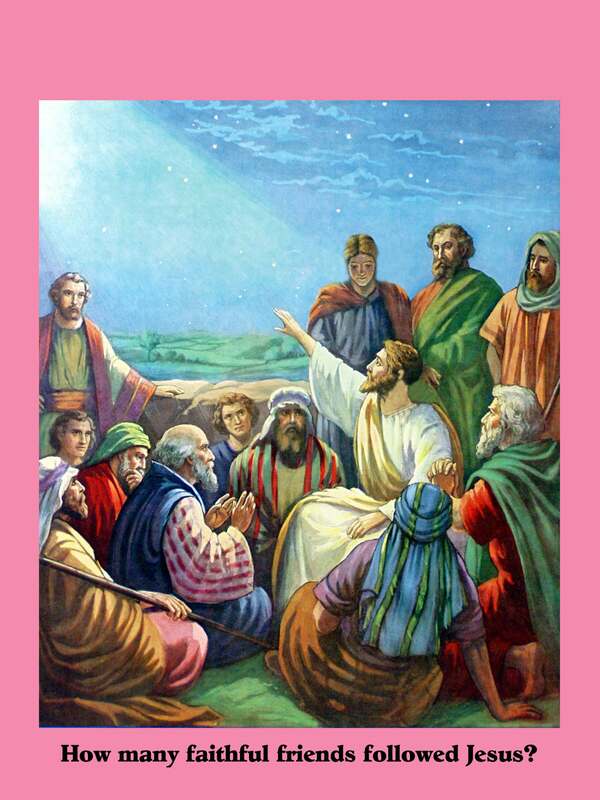 You can make your own or you could purchase my downloadable product called "Bible Book Cards" for only $5.00. Here is a sample picture of what my cards look like. Click HERE to learn how to purchase your own set of Downloadable Bible Book Cards. You will also notice that my cards have points on the back, which means you can make your game even more fun by letting the kids earn points for their right choices. Choose the Bible Book Cards that you want the kids to choose from. Putting all 66 books out might be a little overwhelming. You also want to set your kids up for success. I suggest you place the cards on a pocket chart so that the whole class can see them. "Oh Where, Oh Where, Has My Little Dog Gone?" 3. 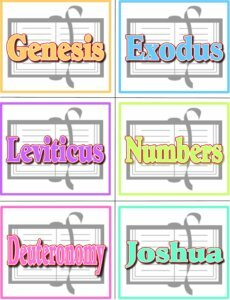 A list of Bible characters that you want the children to learn in which book they are found. 4. This is optional, but I suggest that you grab some great pictures of each of the Bible characters you want to showcase in your game. You can always go to "Google Images" to find some great pictures to print off. You are now ready to play. Simply sing the song with the kids using the name of the Bible character that you want them to find. Show the picture of the character, if using pictures. Let a child come forward and pick a Bible Book Card that he believes contains the character. If you are using points with your Bible Book cards, then the child receives that number of points for his team. A Bible memory verse activity is a great way to teach God's amazing Word and here's a Bible game based on Colossians 3:16. Colossians 3:16 says this: “Let the Word of Christ dwell in you richly as you teach and admonish with all wisdom and as you sing psalms, hymns and spirituals with gratitude to God.” When the Word of God dwells richly within our hearts and our minds I believe this means that we are familiar with God’s Word. For this Bible memory verse activity you will need to prepare picture cards for the Bible characters listed below. On the backs of the picture cards write the statement associated with each character. You will also need to prepare 21 point cards – 4 (10 point cards), 4 (20 point cards), 4 (30 point cards), 4 (40 point cards) and 5 (50 point cards). On the fronts of the point cards write the game title “Who Am I?” Laminate all your cards for long-term use. Place all the point cards title side out on a pocket chart or lay them out on a table. The picture cards should be fanned out in your hand from which the kids will pick. Divide your class into 2 teams. Have a child from the first team come forward. Have him point to a point card. Turn it over to reveal the number of points he could possibly earn for his team. Now read the statement on the back of the picture. The child will now make a guess as to who the person is in the picture. If he guesses it correctly he earns the number of points he picked. If he does not make a correct guess, the other team gets a chance to guess. If they are correct, they will earn double the amount of points that were picked. This will make for a more exciting game. Raise your hand if you can tell me about someone you are familiar with or know really well. (Wait for responses.) Do you guys think that you can know God’s Word really well just like knowing your best friend or a family member? I believe you can. I know it is my desire to have God’s Word dwell within me richly. Who will read Colossians 3:16? (Wait for response.) I’m curious how well you guys know the Bible. How comfortable are you with knowing its stories, characters and truths? Let’s play a game called “Who Am I?” to help us learn to know God’s Word even more. 1. Adam – My first-born son, Cain, killed his brother, Abel, and became the first murderer. Who am I? 2. Noah – I told many about the coming flood, but in the end only myself, my wife, our 3 sons and their wives were saved. Who am I? 3. Abraham – God told me that my ancestors would number more than the stars in the sky. Who am I? 4. Hagar – God protected my son Ishmael and I after Sarah had cruelly sent us away. Who am I? 5. Lot – God told my wife not to look back at Sodom and Gomorrah as we were fleeing for our lives. Who am I? 6. Isaac – I was doubly blessed. My wife gave birth to twin sons – Jacob and Esau. Who am I? 7. Esau – My brother Jacob tricked me out of my birthright, but later I forgave him. Who am I? 8. Jacob – I fell in love with Rachel, but my uncle tricked me on my wedding day and I ended up marrying Leah instead. Who am I? 9. Joseph – My brothers threw me in a well, but what my brothers meant for evil, God meant for good. Who am I? 10. Moses – My mother protected me from being killed when I was a baby and hid me in a basket made of reeds. Down the river I went until I came to an Egyptian princess. Who am I? 11. Pharaoh – My firstborn son died during the plague of death. I let Moses’ people go. Who am I? 12. Aaron – while Moses was on Mt. Sanai receiving the 10 Commandments, I encouraged the Israelites to build a golden calf and worship it. Who am I? 13. Joshua – Caleb and I went to spy out the land of Canaan that God promised to give us. Who am I? A Bible memory verse activity is a great way to teach God's amazing Word and here's a Bible game based on Luke 2:14. Luke 2:14 says this: "Glory to God in the highest, and on earth peace to men on whom his favor rests." As a Christian, I have been taught that my main purpose in life is to glorify God. What exactly does this mean? Well, I am no scholar, but I did hear a great sermon on this topic once and though glorifying God can be a deep theological point, I walked away with an elementary explanation that has helped me ever since. To give God glory means to reflect all that He is in my life. In other words, when people look at my life, I should desire that they see more of God’s character in me than my own sinful character. In fact, the word GLORY spelled backwards gives a great acrostic for its meaning – You Reflecting Our Lord God. Kind of neat, huh? For this game you will need to prepare 3 cards. One will say “Zero”, one will say “100” and one will say “Bonus”. Place these 3 cards in a bag or bucket from which the children will pick. 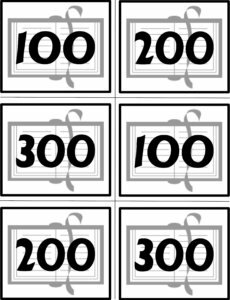 You will also need to make up 12 point cards – 3 of 200 points, 3 of 300 points, 3 of 400 points and 3 of 500 points. Place these point cards on a pocket chart or on table face down. Finally, you will need the Bible review questions found below. Divide your class into 2 teams. After introducing Luke 2:14 to your class and reciting it several times, explain that several will have the chance to say the Bible verse correctly and thus earn points for their team. Have a child come forward. He must answer a Bible review question on glory correctly. If he does, he then gets to reach in the bag that has the 3 cards. If he picks the “Zero” card, he earns no points and the play goes to the next team. If he picks the “100” card, he earns 100 points for his team. If he picks the “Bonus” card, he gets to pick one of the point cards and earns that number of points for his team. He also can earn another “Bonus” point card if he says Luke 2:14 correctly. If he does not say it correctly, the second “Bonus” point card will go to the other team. 1. 1 Corinthians 10:31says this: "Whether therefore you eat, or drink, or whatsoever you do, do [it] all to the glory of God." We can glorify God by doing simple every day things, such as eating and drinking as long as we are doing them for God. "People really won’t ever look at my life and see how I live it for God." "People might actually end up coming to know God and glorifying Him because of the way they see me live my life." "Three ways that I can glorify God in my life are loving my church family, fearing God and honoring those in authority like the President." 5. John 13:35 says this: “By this all men shall know that you are my disciples if you have love one for another." "The best way to glorify or reflect God in my life is by hating everyone." 6. 1 Corinthians 6:19,20 says this: "Or do you not know that your body is the temple of the Holy Spirit who is in you, whom you have from God, and you are not your own? For you were bought at a price; therefore glorify God in your body and in your spirit, which are God's." "As Christians, we need to glorify God in our body and spirit which belong to God." 7. According to 1 Corinthians 6:19,20, our bodies are “the temple of the Holy Spirit.” Therefore, we need to be very careful what we put inside our bodies. We should stay away from anything harmful like drugs in order to glorify God the best we can. "I can glorify God by eating, drinking and taking bad things." 8. Ephesians 5:8-9 says this: "For you once were darkness, but now you are light in the Lord. Live as children of light and find out what pleases the Lord. "As a Christian, I can reflect God’s light of goodness in my life and glorify Him in the process." "As Christians, we can glorify or reflect God by accepting each other just like Jesus has accepted us." 10. John 15:8 says this: "This is to my Father's glory, that you bear much fruit, showing yourselves to be my disciples." Bearing fruit in our lives for God means that we are doing what pleases God such as loving our friends and family and being kind, caring and giving. "To glorify God we must plant lots and lots of strawberries." 11. Psalm 29:2. "Give unto the Lord the glory due unto his name; worship the Lord in the beauty of holiness." The writer of this Psalm knew it was important to admire God’s beauty and His name. This is another way to glorify God. "We can glorify God by appreciating how wonderful and beautiful God is." 12. Deut. 6:5, "Thou shalt love the Lord thy God with all thy heart, and with all thy soul." The best way to glorify God and reflect Him to others is by loving Him. "Loving God with only our liver is the best way to glorify Him." Here is a fun Bible activity for your kids to play to help them learn Revelation 21:4! Each will have a back and front as described below. You could simply write the words on each card or get a little creative and add some pictures to each card. For ease of play, choose a red color of paper for all the ‘bad” things and a green color of paper for all the “good” things. Also, make sure each card includes the number as well. Place each set of cards in numerical order on either 2 tables or 2 packet charts. You are now ready to play the game. 2. A player may turn over two cards that add up to the total thrown – suppose a player throws a 6 and a 1. The player may turn over a 6 and a 1; or 5 and 2; or 4 and 3; or 1, 2 and 4 – all equaling a total of 7. 3. If a player cannot turn over a number on a throw because the number has already been turned over, the die is passed to the next player. The player does not turn over any numbers on that turn. The first team to turn over all of their “No Mores” is the winner. Tip: You may want to require that a child recite Revelation 21:4 before getting to throw the dice. What do you look forward to about Heaven? (Wait for responses.) Do you want to know what I look forward to? I look forward to the “No Mores”. You know…no more death, no more crying and no more pain! Who wants to read Revelation 21:4? (Wait for response.) Revelation 21:4 paints a perfect picture of eternal life with Jesus. Let’s play a fun Bible school activity to help us learn about the “No Mores” and their opposites in Heaven. At this point, explain the rules of the game and show our class and discuss the opposites to each of the “No Mores” on each of the cards. Bible games for kids are a great way to teach God's amazing Word and here's a Bible game based on John 14:2. 2. there are many rooms. 4. I would have told you. Finally, you will need a container big enough to hold 4 of the above items at one time. You will also need to cover the container in such a way that a child can reach into the container and feel each of the objects without looking at them. You are now ready to play the game. After introducing John 14:2 to your class and reciting it several times by looking at the Bible verse display, show the children the covered container of 4 objects. Explain that each child will get the chance to insert his hand into the container for 30 – 60 seconds to explore the contents only by touch. The whole class now says the whole verse together with help from looking at the board. Play several times making sure each child gets a chance to guess the objects. If you have more than 7 children in your class, just switch around the objects for each round. Who built the home you live in? (Wait for responses.) How many rooms are in your house? (Wait for responses.) Did you guys know that God is preparing a home for His children in Heaven? It’s true. Who would like to read John 14:2? (Wait for response.) Can you even begin to imagine how amazing that house is going to be? Wow! John 14:2 is a great Bible verse to memorize to help you think of how wonderful Heaven will be one day. Let’s play a game called “What’s in the House?” to help us memorize this great Scripture. At this point, have the children recite John 14:2 several times before playing. Have fun! "Whoever believes in the Son will have eternal life, but whoever rejects the Son will not see life." Here is a practical article on how to share the Gospel with preschoolers along with creative ideas to do so. Who doesn’t like to hear good news? Adults and children alike love being the recipients of good news. And preschoolers are no different. God has wired the preschooler with extra quantities of joy when hearing good tidings I believe, and in my mind, they are ready to hear the best news of all - the Gospel, or good news, of Jesus Christ! In its very essence, the Gospel of Jesus Christ is simple: God made you. God loves you. God wants to have a relationship with you. But you are a sinner, which prevents the relationship from happening. But God loves you so much that He was willing to do what it took to bring you into relationship with Himself. So, He gave His only Son, Jesus, to die on the cross for the forgiveness of your sin. But Jesus did not remain dead. He came back to life and lives in Heaven with His Father, God. When you believe that Jesus died for your sin, you can now have a relationship with Him that will last forever. You must begin sharing the main points of the Gospel and God’s Word at the child’s level. Begin sharing God’s truths carefully and simply and the Holy Spirit will begin to give them understanding little by little - just as He has done for you. So, let’s look at the main points of the Gospel and I will present you with some creative ways to share God’s wonderfully good news with your little ones. Point #1: God Loves You! Preschoolers are “love-sponges.” If you are willing to poor some love into their lives, they are usually ready to receive. They are even ready to receive the fact that they can be loved from afar by a long distance family member such as Grandma or Uncle Bob. Preschoolers are definitely ready to hear that God loves them. I believe God wants us to tell our children that He loves them as much as we possibly can. Preschoolers are fascinated by their bodies. Sometimes they just like looking in a mirror to discover more about who they are. And God knows everything about them, even the number of hairs on their head. At this age, it is important to carefully navigate your children through the differences they may see with other children. I work closely with children and adults with special needs and I always focus on their abilities and the hearts that God has given them. God, Himself, says that He looks at our hearts. That is His focus and it should be ours as well. Teaching your children at an early age to discover a person’s true heart will be one of the greatest lessons you can ever give. How Did God Make You? While God has made preschoolers to be very self-absorbed at this age, they are also learning fundamental social skills. In other words, they are learning how to be a friend. Friendship can be a frustrating road at any age, and preschoolers are also figuring out how to navigate around different personalities. But God can be their very best friend. He’ll never make fun of them. He always wants to be with them and He wants to share His love with them. who doesn’t want a friend like that? I love CEF’s (Child Evangelism Fellowship’s) definition of sin: Sin is anything I think, anything I say or anything I do that makes God unhappy. This is the definition I use when teaching about sin to preschoolers. Although they are young, they are becoming very aware when they do something wrong. When you see a preschooler commit a sin, I believe you need to take them aside and lovingly point out what they did wrong, who or what got hurt (if anything), and then point out the truth that God does not like it when we sin. As the Holy Spirit is teaching this child through your leading and guidance, the child will become more aware and sensitive to doing wrong. They must then go and say they are sorry for what they’ve done and tell God they are sorry, too. Unfortunately, we live in a society that squelches the practice of doling out consequences for our wrong doings, but as Christians, we have an obligation to teach our children early on, that when they sin, they are doing so against God. Point #5: Jesus Died to Forgive Your Sin and Is Alive! This Gospel point is the Easter story in a nutshell. It’s also the most sensitive point to share with preschoolers. While I am a proponent of sharing the message that Jesus died on the cross, I encourage you to be very aware of the sensitivities of the children whom you work with. You should never share the gory details of this part of the Gospel with your little ones. But you can point out the fact that Jesus loved your children so much that He was willing to be hurt for them. Preschoolers already understand pain. They know what it means to bleed and have scrapes and “owies.” As the Holy Spirit works in their lives, prayerfully they will become more aware of Jesus’ great love for them and slowly, but surely, understand His great sacrifice. The following is a link to my story, The Little Hill. This is a great rendition of the Easter story at a preschool level. Point #6: I Believe in Jesus! and Someday I’ll Live with Him Forever! The last main point of the Gospel to share with your preschoolers is the chance for them to declare that they believe in Jesus and eternity with Him. As mentioned before, preschoolers don’t need to see Jesus to believe in Him. They are children and Jesus said, "Let the little children come to me, and do not hinder them, for the kingdom of heaven belongs to such as these.” (Matthew 19:14) I believe God made this profound statement to remind us that our faith in Him must be like that of a little child - you don’t have to see to believe. Should you ask your preschoolers to believe in Jesus? In my opinion, absolutely! Do they know and understand everything about the Gospel? No, but with any kind of learning, you must let the child declare what he does know to be true at the time of his learning. God is using you to help build a relationship with Him truth upon truth. In closing, if you haven’t already started to share the good news of Jesus Christ with your preschoolers, begin now and begin well! 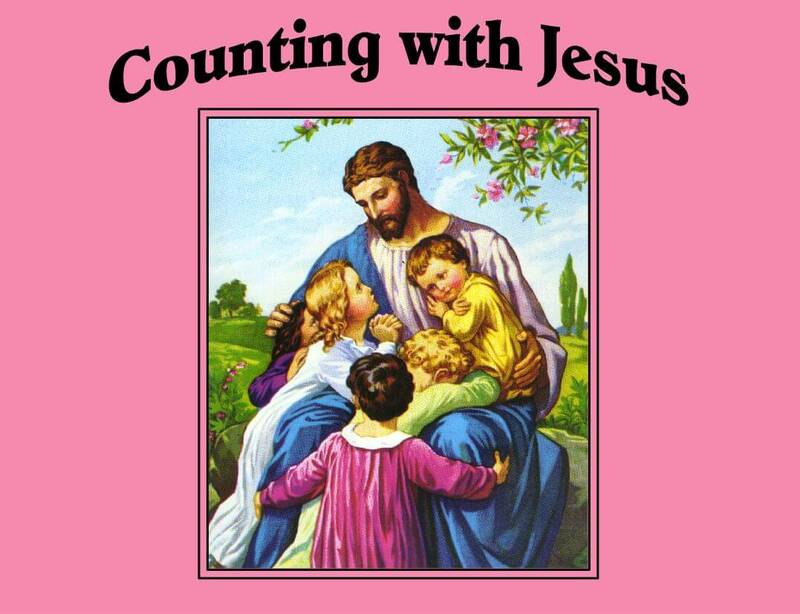 Here is a fun Bible activity for preschoolers called "Counting with Jesus" -helping them learn their numbers and be introduced to some sweet Bible stories and themes. I love coming up with creative ways to combine the Bible with other lessons preschoolers are already learning. Take for example, counting. Your little ones are learning their numbers. It's exciting to see and hear them count. It's even more exciting when you know they are learning about Jesus too. Try this fun Bible activity for preschoolers to help them count and learn about Jesus at the same time. You will see that I've also given you slides that "circle" each of the things or people you are asking the children to count. These slides work very nicely as a Power Point or Keynote presentation. To present this Bible activity for preschoolers, you can either print the visuals I've given you and display them on a chart or table or as mentioned before, as a Power Point presentation. 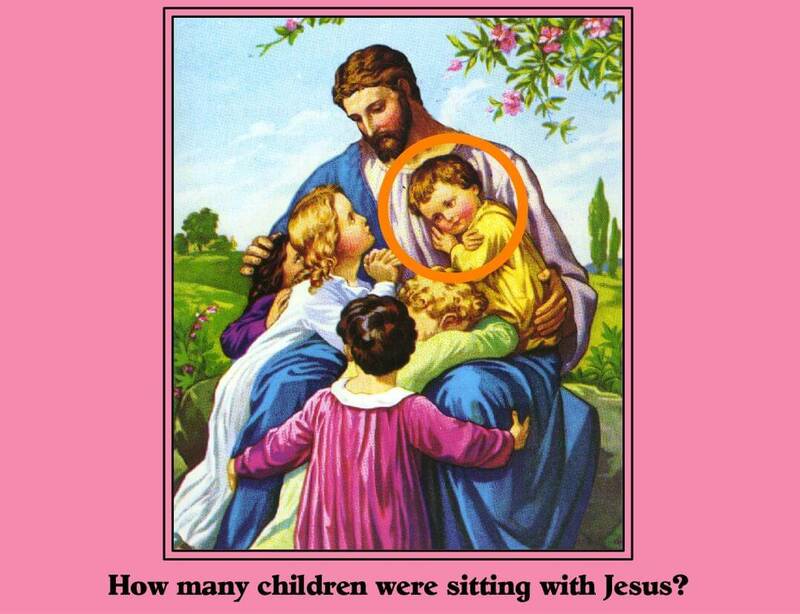 "Now, let's play a little game called "Counting with Jesus." 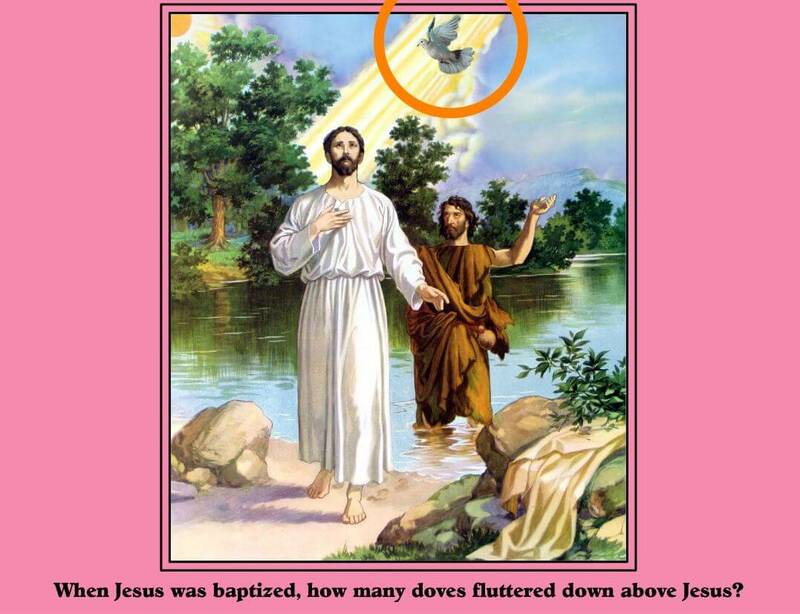 I am going to show you a Bible story picture up on the screen. Each story asks us a counting question. 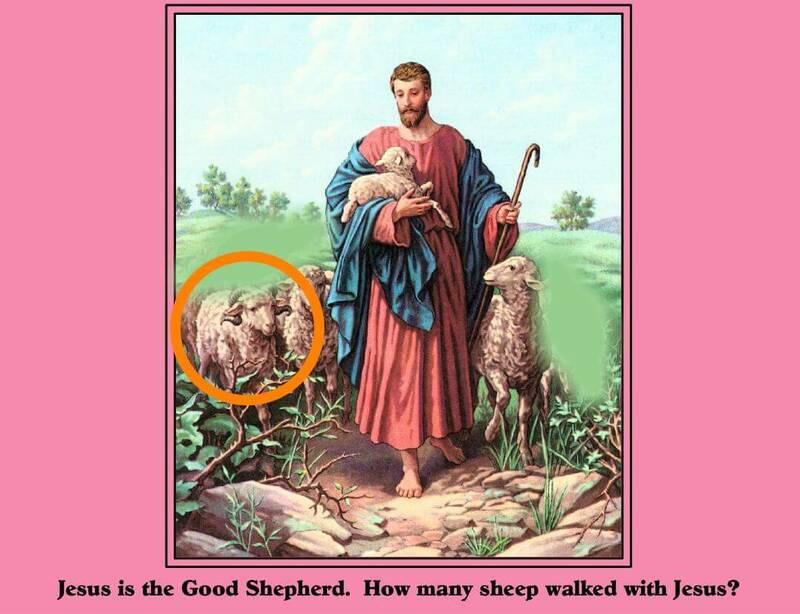 For example, if I showed you this first picture we would get to count how many friends or disciples Jesus had. Let's do that now...12 is a big number. Let's see how well you do on the other Bible story pictures." Have fun counting with Jesus! goodness, faithfulness, gentleness and self-control." The Fruity Match Ups Game - Playing Bible games for kids is a great way to help them learn about God’s wonderful Word, the Bible. Click HERE to purchase the game as a tangible item that will be shipped to your home. 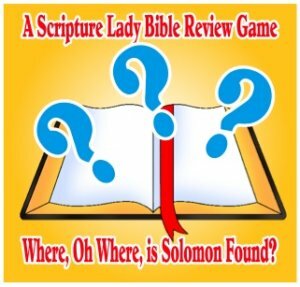 Click HERE to purchase the game as part of Scripture Lady's "10 Games for 10 Bucks" Downloadable Package. Did you know that your kids are always producing some kind of fruit? Hopefully, it's not the rotten variety, but the kind that gushes forth the "Fruit of the Spirit." Galatians 5:22 says: “The fruit of the Spirit is love, joy, peace, patience, kindness, goodness, faithfulness, gentleness and self-control." These 9 characteristics are ones we all should have in our lives. Here is a fun game reminiscent of the old standard "Concentration" to help your kids think about each of these great fruits and their importance. 9 Pairs of cards, each pair representing a fruit of the spirit: love, joy, peace, patience, kindness, goodness, faithfulness, gentleness and self-control. 2 BONUS Cards 20 Backing Cards - I used a picture of a fruit basket for my backings. Laminate all the cards so that they will last for a long time. Set Up: For this game, I use a pocket chart (approx. 28" square). (You can find pocket charts at your local teacher supply store or online at www.orientaltrading.com) Place all 22 cards onto the pocket in random mixed up order with the fruit baskets showing. Pick a scorekeeper to keep track of all scoring. I always use a white board sitting on an easel for scoring. I also place my pocket chart on an easel. How to Play: Divide your children into 2 teams. Decide who will go first. Give a child from the first team a multiple choice question found below. If he gets it correct, he now gets the chance to turn 2 cards over in hopes of finding a match. If he does make a match, he earns 100 points for his team, the cards are removed from the board and his turn ends. If he does not make a match, turn the 2 cards back over. It is now the next team's turn. The team with the most matches after all the multiple choice questions have been asked is the winner. Bonus Cards: If a child picks a Bonus card out of the 2 cards he turns over, then his team gets 150 points. If the child picks 2 Bonus cards in one turn, then his team gets 200 points! Suggestion: When a child makes a match tell them they can earn 50 extra points if they can give an example of how they could use that fruit of the Spirit in their own lives. “The fruit of the Spirit is love, joy, peace, patience, kindness, goodness, faithfulness, gentleness and self-control." 1 Corinthians 14:33 says this: "For God is not the author of confusion, but of peace,...." Our kids need to know that, in His time, God will always work to order things for their good and take away confusion. 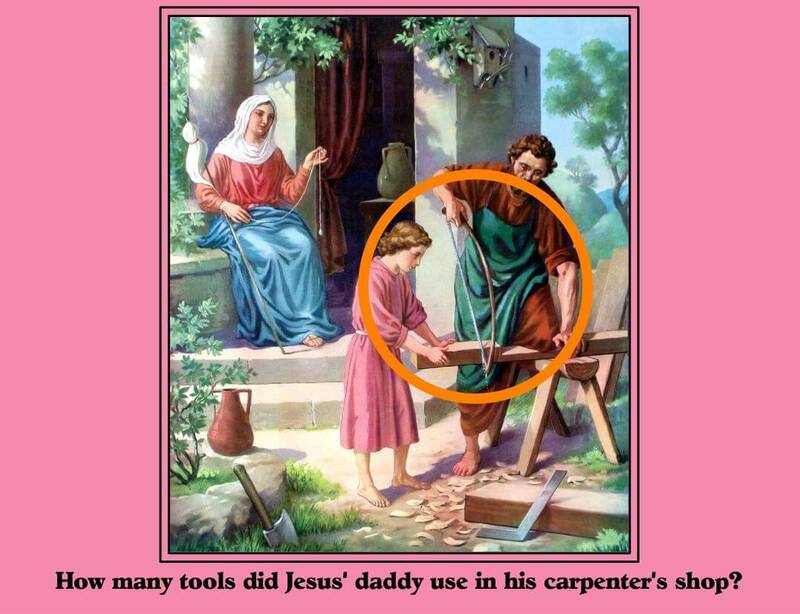 Play this Bible memory verse game called "Mismatched Messes" to help them know this truth. Life has a way of throwing a lot of curve balls our way, but isn't it wonderful to know that God is not surprised by any mishaps or mayhem in our lives? Not only that, because "...God is not the author of confusion, but of peace,...." we can believe that He will bring clarity in all our confusing situations and in the confusing situations of the whole church. 1 Corinthians 14:33 is a Bible verse that many Christians have memorized over the years and your kids should memorize it too. Here is a fun Bible memory verse game to make the learning of this great scripture even more fun. I call it "Mismatched Messes." Follow the directions below to learn how to play the game. How to Play the Bible Memory Verse Game for "God is Not the Author of Confusion"
Help the children learn and memorize the verse by saying it over and over again many times. You might even want to put the verse to some music to make it easier. Check out some of my other ideas for memorizing Bible verses by clicking HERE. After your children have some level of comfort with knowing the verse, it's time to test them. Divide your class into 2 teams. Have one child go out of the room where they cannot see or hear what you are doing. Have the rest of the class mismatch 5 things in the room. For example, kids might trade shoes or glasses or other articles of clothing. You can also rearrange furniture. Put a chair upside down or face a table a different way. Get creative. Have the sequestered child come back in. In order to play the game, he must say the Bible verse correctly. If he does, he now has 30 seconds to figure out as many of the 5 "mismatches" as he can. For every mismatch he gets correct, his team gets 100 points. But for every mismatch he DOES NOT get, the other team gets 100 points for each of the incorrect guesses. Play back and forth between teams until all have had a chance to play at least one time. Have FUN! Click HERE to get the songs! I LOVE using Darcie Maze's puppet Scruffy in all of my preschool programs. 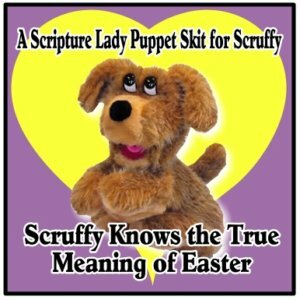 This Easter, Scruffy shows the children that he knows the true meaning of Easter - that Jesus gave his life on the cross, but rose from the dead and is ALIVE! Use this cute script to teach your kids the true meaning of Easter. If you work with preschoolers, I truly hope that you use puppets. One of my favorite puppets to work with is Darcie Maze's puppet Scruffy. He's cute and lovable and very easy to use. All of Darcie Maze's puppets are easy to manipulate unlike other puppets that tire your hand out after only a minute or so. If you would like to check out her website and learn more about Darcie Maze's puppet Scruffy, go to "Puppets with a Heart." The script that I want to share with you today is all about how Scruffy shows that he knows the true meaning of Easter. SL: You want to make sure that the Easter bunny knows that you like him? SL: Oh, Scruffy! You silly boy! Easter is not about the Easter Bunny! Scruffy interrupts by whispering again. Scruffy interupts by whispering again. SL: Scruffy. Nothing is inside your heart! You interupted me telling the part of the Easter story of when Jesus was placed in the tomb, but on the third day Jesus came back to life and the tomb was empty....Ohhhhhh! The tomb was empty, just like your heart! You were trying to help me tell the story, huh Scruffy? SL: I'm sorry, buddy! You really do know the true meaning of Easter, huh? SL: You're so smart, Scruffy! And you know that Jesus is alive, huh? SL: See, they're smart like you, Scruffy! Alright, buddy, we have to say goodbye to you now so I can teach the kids more about Easter. Everyone say, "Goodbye" to Scruffy! If you liked this Sunday School/Homeschooling idea, then sign up to receive Scripture Lady's Free Email Kid Tips packed full with creative ideas and receive 12 FREE Bible downloadable resources to help get the kids you minister to excited about the Bible!